The "Black" Line is your normal daily Stochastic Oscillator. The "Yellow" Line is your Signal line. The "Blue" Line is your Pulse line. The "Red" Line is your Scan line. This is common with the normal Stochastic Oscillator function. However, as a stand alone it can be very misleading as it can stay overbought or oversold for an extended period and is prone to false signals. The rules on the Blue and Red line is - they both plot the current position of the market and move in lag to the Yellow signal line. Remember, The Yellow line is the signal line that you follow for the current days reading. NOTE: It is important to remember that the Yellow line often will lead the market 3-5 days out! So you need confirmation with the daily price action. 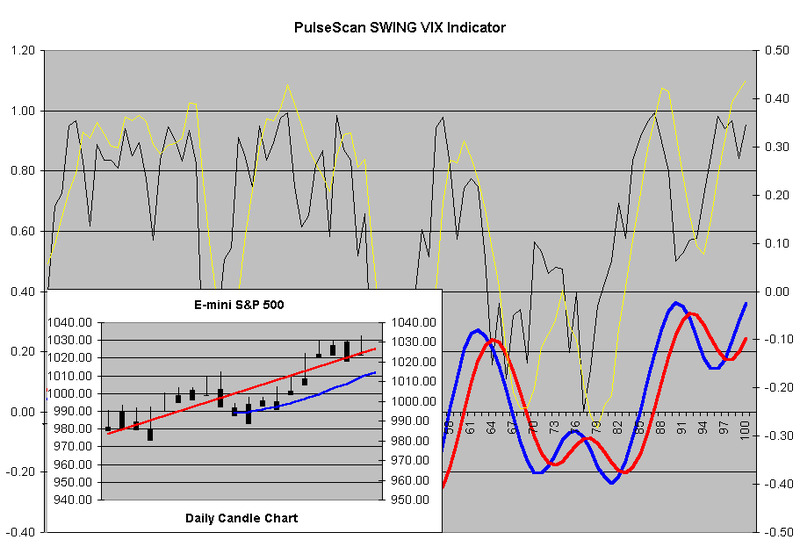 The PulseScan Swing Vix Indicator is an awsome stand alone indicator and will work even better when used with MACD, ADX, and price action. As a trend following indicator its the best I've ever seen. It has been able to predict major turning points in the Major indicies. I think that you will find it most helpful when used in conjunction to what ever you use now. *"GAP-MOVE" ENTRY Days: These days are more common after a significant rally or sell-off they appear during a brief period of consolidation within the trend. Watch & Wait for the pullback toward Intra-Day SUPPORT/RESISTANCE to be confirmed before placing the "GAP-MOVE" LONG/SHORT ENTRY. Remember to watch the market for the whipsaw that is more common on these days especially when taking on the reversal. *"TRENDING" ENTRY Days: These are days were the market is expected to rally after a pullback. It should be noted that although it is also possible to get whipsawed on trending days as the market tends to run out of steam and consolidate intra-day these trades tend to yield substantial profits as the market begins to break out into higher highs as the trend begins to resume.